I've been trying to get my quilt project done but I just keep running into issues. PLUS, I'm not that happy with how the colors look together. In the mean time, I've found so many adorable quilts on other blogs that I want to share. These are some of my favorite sites for quilting. 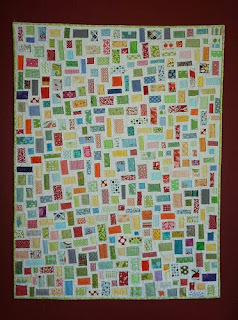 This first quilt is from a blog called Side Notes that a friend of mine is an author at. I love the color combinations and the simplicity of this quilt. I can see pink and brown in my head for a baby girl quilt. Go check out this quilt and their other great quilts by going here. This second quilt is from one of my favorte quilting sites called Moda Bake Shop by the author of my final favorite quilting site, Crazy Mom Quilts. Moda Bake Shop not only has wonderful ideas but they actually explain how to do it yourself! This quilt is one of many that I have loved from them. It is a sweet baby quilt measuring 45" by 54". Click here to get the instructions for this baby quilt. This final quilt I love so much. It is from Crazy Mom Quilts called the tinker tape quilt. She made the quilt out of scraps. What a great way to use all of them up. I absolutly love the ragged square top. So simple! I've also decided to stop by IKEA as soon as possible and hope that they still have the fabric for the back of the quilt around! How fun is that!!! What a work of art! I can't imagine putting something like that together!